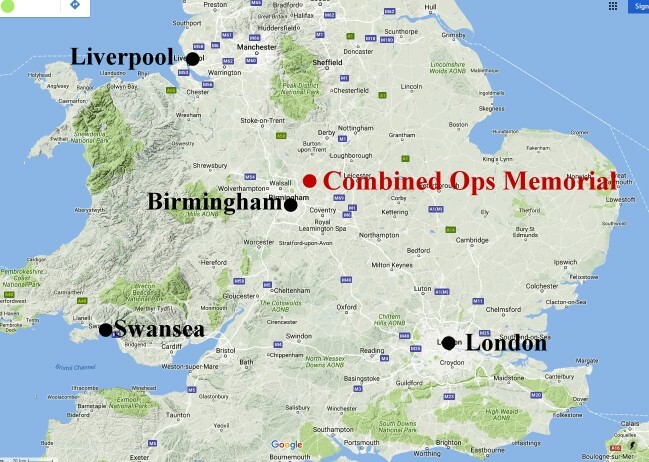 Significant events in the Combined Operations Calendar. 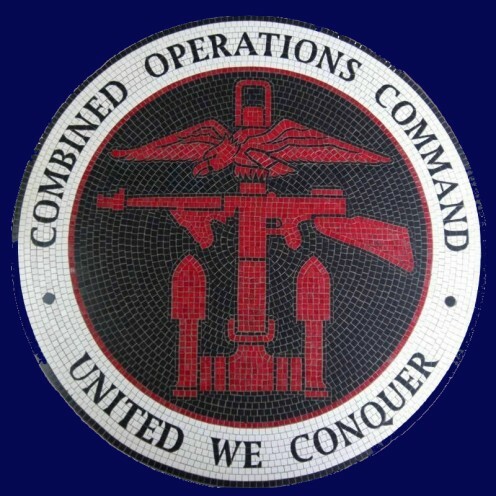 The Combined Operations Badge design was approved. Op Claymore, Lofoten Islands Raid, Norway. Op Chariot, St Nazaire, France. Op Neptune & Overlord, D-Day, Normandy, France. Mulberry Harbours. The first markers were positioned to aid construction. Op Corkscrew, Pantelleria, Mediterranean Island. Op Catapult, Mers-el-Kebir, French Algeria. Keyes appointed Director of Combined Operations. PLUTO fuel pipelines to France became fully operational. Op Starkey, North West France. "The raid that never was." Op Aquatint, "Omaha" Beach, France. Infamous "Commando Order" was issued. Op Flipper, Rommel's HQ, North Africa. Op Frankton, River Gironde, France (Cockleshell Heroes). Op Anklet, 2nd Lofoten Islands Raid, Norway. If you plan to visit the memorial, you'll find useful information on the link to help you make the most of your day... and, if you wish, you can add a photo of your visit to this website in remembrance of a veteran of your choice. 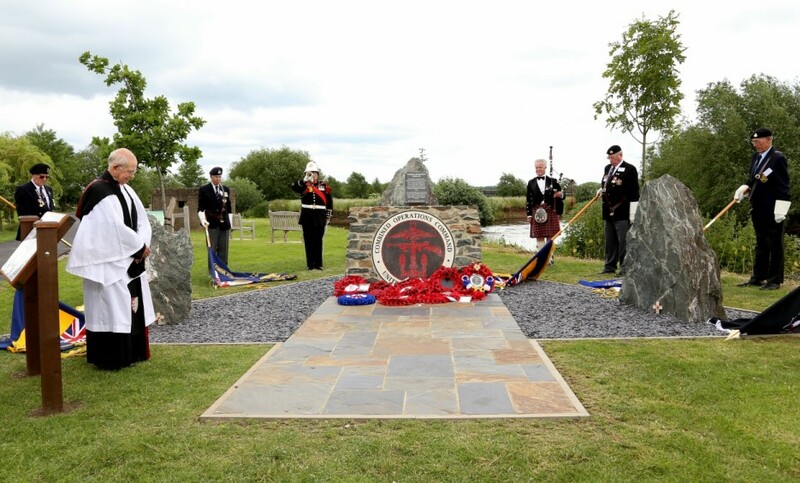 On Thursday, July 4th 2013, in the presence of Her Majesty's Lord Lieutenant of Staffordshire, Mr Ian Dudson, CBE and 200 guests, including 25 WW2 veterans and 6 Standard Bearers, the Combined Operations Command Memorial was unveiled by General Sir Richard Barrons KCB CBE ADC Gen, Commander of the Joint Forces Command. It was dedicated by the Reverend Prebendary, Tony Wood. On June 4th 1940 Churchill sent a memorandum to his Chief Military Assistant and Staff Officer, General Ismay. He was Churchill's main communications link with the Chiefs of Staff. The memorandum warned against the dangers of concentrating too much on the defence of the United Kingdom against enemy attack or invasion. "It is of the highest consequence to keep the largest numbers of German forces all along the coasts of the countries they have conquered, and we should immediately set to work to organise raiding forces on these coasts where the populations are friendly." Two days later he continued on the same theme, "I look to the Chiefs of Staff to propose me measures for a vigorous, enterprising and ceaseless offensive against the whole German-occupied coastline." On the 14th of June the Chief's of staff appointed Lieutenant-General Alan Bourne to the amply described post of "Commander of Raiding Operations on coasts in enemy occupation, and Adviser to the Chiefs of Staff on Combined Operations." Bourne was 58 and had been in charge of the Royal Marines for about a year. His wide experience on land and sea and attendance at the Imperial Defence and Army Staff Colleges were no doubt factors in his selection for this new and challenging post. Churchill was not consulted about the appointment during these frenzied and anxious times. Whilst he held Bourne in high regard, he felt he was too close to the Admiralty to be able to operate without undue influence from them and he lacked the seniority and authority to deal with the three Ministries. On the 17th of July 1940, Churchill appointed Admiral of the fleet, Roger Keyes, to the newly named post of Director of Combined Operations. 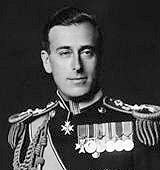 He was succeeded by Lord Louis Mountbatten, who held the redefined post from 27/10/41 until he moved to Burma in October 1943. Major General Robert Laycock then held the post until 1947. Combined Operations made a huge contribution to the successful outcome of the Second World War by planning, equipping and training for offensive amphibious operations after the evacuation at Dunkirk in June 1940. In the ensuing years, there were many raids and landings mostly against the Axis forces from Norway in the north to Madagascar in the south and from the Mediterranean in the west to the Far East, culminating in the D-Day Invasion on the beaches of Normandy on the 6th of June 1944. The Command drew on the best practices and expertise the Royal Navy, the Army and the Royal Air Force had to offer to create a unified force. Many of their top planners and experts formed the nucleus around which the Command was formed and, as the requirements of offensive operations took on an international dimension, the service personnel of many Allied countries proudly wore the Combined Operations badge. In addition to the nations represented by the flags in the banner heading, German speaking refugees from the following countries served in No 10 Inter-Allied Commando, particularly No 3 Troop. They were; Austria, Czechoslovakia, Denmark, Germany, Hungary, Romania, Russia and Yugoslavia. Greece's Sacred Commando Squadron was not part of Combined Operations but in all regards they served the Allied cause in defence of their Homeland, hence the inclusion of their flag on this website. The 'All Pages Index' (above left) has brief descriptions of around l70 web pages about this amazing and ubiquitous WWII organisation whose auspices included such diverse subjects as Commando Raids and Major Landings, Landing Craft Training for hundreds of thousands, Mulberry Harbours, the PLUTO Pipeline project and even top secret experiments on an unsinkable "Ice Ship" in the Rocky mountains. It's a testimony to the enduring nature of the Combined Operations concept that the Combined Operations Badge, designed by Lt D A Grant, RNVR, in 1942, is still in use to this day in a number of countries worldwide. 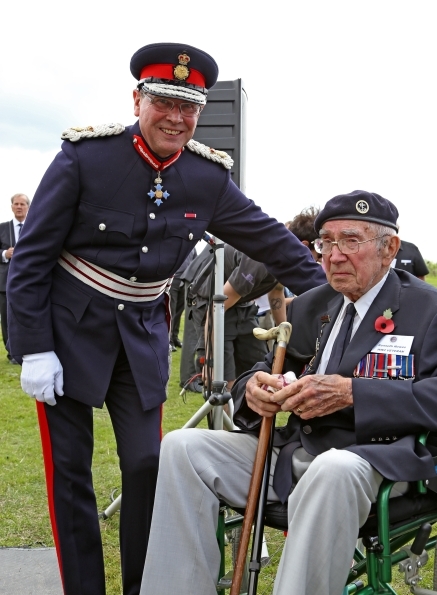 A WW2 veteran from Canada and his friend were travelling north to Scotland by rail, having attended the 60th anniversary D-Day commemorations in Normandy. They engaged an elderly lady in conversation and found they had much in common. The veteran had served in Combined Operations as an LAC on a radar vessel off the beaches of Normandy and her late husband had been an officer in the Combined Operations Pilotage Parties (COPPs). His clandestine visits to the landing beaches prior to invasions, provided invaluable intelligence on enemy defences, hidden obstacles and beach and tidal conditions. The miles drifted by almost unnoticed as they relived their youthful memories of wartime... for she had also served her country in the WAAF, including some time at RAF Charterhall, near Kelso, in the Scottish Borders. Unbeknown to them all, a young business woman, sitting nearby, overheard much of the animated conversation over several hours. 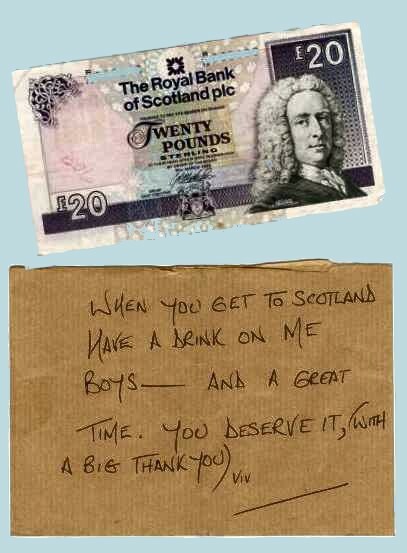 At York she slid a sealed envelope onto their table as she left the train. She was gone before they had time to gather their senses. 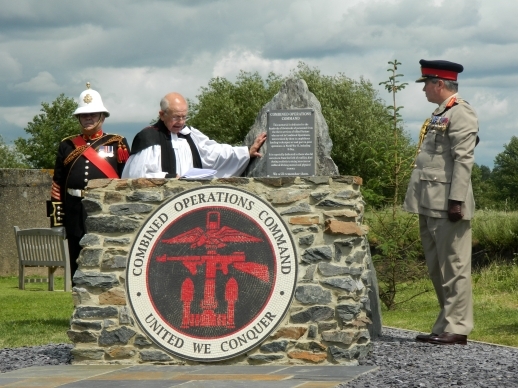 Wherever you are in the world, your life has certainly been touched by the achievements and sacrifices of those who served under the Combined Operations Command in WW2. Viv felt compelled to show her appreciation and gratitude having heard but a tiny fraction of the experiences of just a couple of veterans.